Will their season end before it's over? And each time out, he'll keep the hope alive. Will make opponents hear, "Sit down, Mister!" His arm for 20 wins could well be used. For thirty starts again, he should be beckoned. And he still can, he's only twenty eight. Fifteen-plus wins, he's no one left to blame. A few more years, and he's over the hill. Provide six innings, quite reliable. 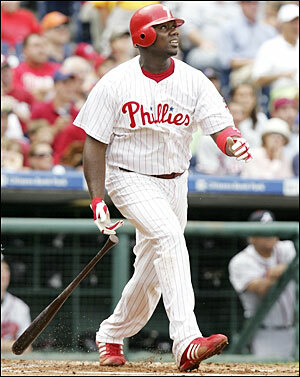 Who helped the Phils to beat the Tampa Rays. Though some thought him done, and with good reason. Though I doubt it, if I must be truthful. Will likely blow up this year in The Vault. Won't help much, unless someone surprises. The same poor pitching, in many guises. Batters, for Phillies Phans to cheer thereof. It won't be his fault, he's like Gibraltar. Some quality arms, some who are re-treads. "Should regress some from last year's performance. To anything they had done before this!" By not pointing this out, I'd be remiss. And his slow change-up, "Bland ultimatum!" He's both young and quite good, so have no fear! Their '08 levels and be more than LAIM. To coax outs from them will take a soft touch. If there's more relief help, it's hard to see. Such dreck in the majors? No! Please not here! Of an MVP, to him, they must toast. Though still a great shortstop, Jimmy Rollins. But don't expect vintage Kenny Lofton. His small stature, his talent belyin'. Still in his prime, just 28, he is. Stops up the middle. Perhaps a Gold Glove? But Philly will need more than him this year. For driving in runs and hitting some jacks. His VORP, on his own team, ranked #3! But much like Casey, per Ernest Thayer. But more power than erstwhile Chernobyl! And in comes Raul: Older, not cheaper. With injuries, or else early, ages. To start his decline phase, slow attrition. By June, for Pat, Phils' Phans could be wishin'! But can he build on last year's good numbers? Or will his bat instead choose to slumber? That he's OK now, beyond this he's moved. Or maybe just when he hits, not switching. Who seems to make outs with relative ease. But hitting .250 is all he's got. OPS so low, how's he show his face? Production from theirs, so help's not coming. City of Brotherly Love? Soon bumming. But at least his bat isn't still playing possum. To help the Phillies' run differential. Nor does Lou Marson, or Ron Paulino. Eight's a black hole for the Phils, as we know. Long as they're usually riding the pine. But none whose star was bright very recent. Geoff found his at-bat count sort of lagging. And hopes for a 2009 rebound. Now 41, his career's depleting. But this year he'll post too many zeroes. But where can he fit in their equation? They'd cut him loose if they were rational. Like pre-owned cars, with no shortage of miles. And run just a bit, in case they have need. His wife he won the job in Spring Training. Giles seems to have no more miles remaining. To spell Feliz from all his out-making. But his bat makes up for all his glove's wrongs. Of returning to October Dances? 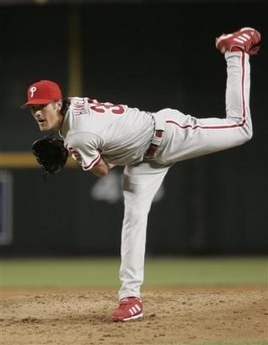 The Phillies will have trouble reprising. Though none of these teams will draw critics' raves. Injuries could, the Phillies, sabotage. To climb out from, as these hurts take their toll. Will need much luck to stay up in the stream. Eighty five wins is the safe bet, I fear. This is great. I am really impressed. We have been doing baseball poetry at bardball.com for a while now...if you ever want to submit something for publication, please feel free; we'd love to have you. You need a parade to commend you efforts, I could never do this. This brings me back to why I hate Shakespeare. Iambic Pentameter= hard to read and corny. This must have taken; days-weeks. Impressive but unnecessary! Out-frickin'-standing!!! How long did this take you to do? Wow. Took me about a month to do, squeezing it in on weekends and lunch hours. I had recently listened to the Canterbury Tales on CD and thought it would be interesting to do it this way. Wish I'd gotten more readers for it, but I appreciate the positive feedback.